A new game that I was incredibly psyched to play was Mousquetaires du Roy . In the Musketeer game (as I will refer to it, as I can type it much more easily and not have to constantly check my spelling), one player takes on the role of "Milady" and tries to disgrace the queen, siege the city, and destroy the musketeers. All of the other players take on the role of different musketeers (yes, from The Three Musketeers books) and try to restore the queen's name by completing several epic quests (to find the queen's diamonds and whatnot). To start the round, Milady will secretly select which location she will go to (she can try to hinder the musketeers directly at certain locations, and at other locations, she can get extra cards that will let her indirectly hinder them by doing things like dishonoring the queen and causing the turn track to move faster). After she selects a location, she is able to play a new Paris card (quest that seriously jacks with the musketeers), and finally she can either draw or play a treachery card (continuing with the theme, this also jacks with the musketeers). Next, each of the musketeers can take their turn (in any order). They each get a certain number of actions based on the number of players in the game. With these, they can move, draw cards, attempt challenges and duels (these are how they complete quests like the Paris cards and the epic quests that win them the game), buy upgrades, and exchange cards/equipment. The heart of the game is in the musketeers working together to thwart Milady's evil schemes. Finally, there is some round cleanup - the siege is adjusted, the time track advances, and the queen is possibly dishonored. If the musketeers can work their way through all 4 of their quest boards before Milady reaches any of her victory conditions, they win! The first thing that I found interesting about the Musketeer game is that the Musketeers could take their turns in any order. I can't think of any other games with this mechanic, and I think that it really added to the gameplay. Since Milady was able to determine many different things (such as what was at various quests and how they were to be completed), it was really important not only to make the most of each Musketeer turn, but also to do them in the best possible order. There will be many situations in which one of the Musketeers will be the best at completing a challenge and so the other Musketeers will go before him to clear out any potential duels that he may encounter or to help equip him by drawing extra cards and giving them to him. I can't speak highly enough of this mechanic - it is a very small thing and easy to miss (in fact, I missed it until about halfway through the first game), but it is a nice addition. The next pro is the balance of the game. This is a pro that I probably use too often, but this particular game's review would be completely lacking if I didn't cover this topic. The game in which I played Milady was just about the closest game of any kind that I have ever played. On the last round of the game, the Musketeers completed the final quest on the last Musketeer's turn (and by using the mechanic that allowed them to pick the order in which they went). If they had not been able to complete everything on that round, then I was going to successfully disgrace the queen to start the next round. Balance like this shows good playtesting, and I think that is one of the reasons that I bring is up so often. Kudos. One last thing to note: the game is easier for the Musketeers if there are more of them. Whereas there are elements in the game that attempt to balance that (such as them having extra actions and cards in smaller games), there are a couple ways that aren't really offset. First, if there are more Musketeers, the number of wounds that can be distributed among them before any of them if knocked out is higher, and second, having a Musketeer knocked out is less detrimental. Think about it for a second, if you are playing with 3 Musketeers with 4 actions, and one Musketeer is knocked out you lose 4 actions, whereas if you're playing with 4 Musketeers with 3 actions, you only lose 3 actions when one is knocked out. This doesn't really affect the gameplay either positively or negatively, but is something worth noting when you play the game. If Mousquetaires du Roy sounds interesting, you might also check out Mice and Mystics, Star Wars: The Card Game, and Talisman 4th Edition. 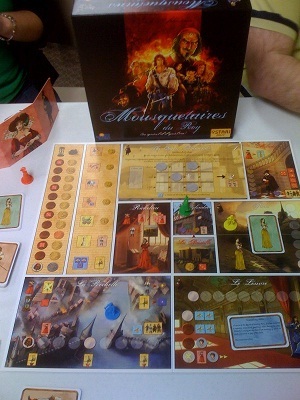 I would like to thank Rio Grande Games for providing me with a demo copy of Mousquetaires du Roy to review. 2) You really need to try Fury of Dracula (if you haven't already). It has a similar structure, with one person being Dracula and everyone else being the hunters. Chris - welcome to the site! 1. From what I remember it is about 1.5 hours long - longer if the people you play with take forever, but what game isn't like that. 2. Very well, I will look into it. I'm always up for game suggestions. Maybe this one is old enough to pick up in a trade on the 'Geek.